BMW 4-Series Forums > BMW 4-Series (F32/F33/F36) Forum > BMW 4-Series Forums General Discussion > KW Supsensions Rebate - Get Up To $350 Back! 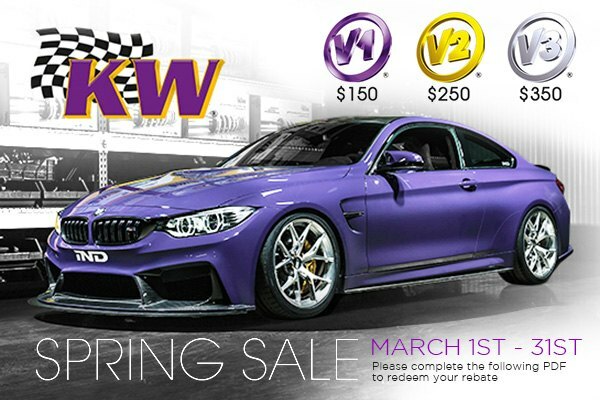 Spring Sale on KW Suspension Products at CARiD! Purchase KW Suspensions V1, V2 or V3 Coilover Kit and GET up to $350.00 rebate. Don't waste your time! This offer is valid through March 31, 2019. If you're looking to lower your BMW to a specific height without sacrificing on comfort, KW Suspensions will be your best bet. Their fully bolt-on coilover kits are available in 3 versions, depending on your driving style and height ranges you're looking for. KW Suspensions coilovers offer a wide range of ride height adjustability and damping levels. Designed for a pure, trouble-free driving experience they give your BMW a nice stance and sporty handling. Take your BMW to the new heights with KW Suspensions! Please complete this PDF form and follow instructions to get your rebate. Last edited by CARiD; 03-14-2019 at 10:44 AM.